The American Dream. . Wallpaper and background images in the 美利坚合众国 club tagged: america awesome best country. 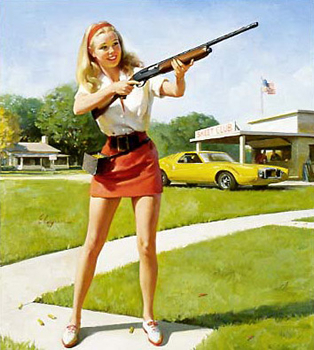 ...the gun nut in me wants to point out that she's holding the shotgun completely wrong, though. Firing like that would either drop her to the ground or throw the gun onto the sidewalk behind her. Ah, but the shells on the ground might suggest that she's just finished pumping a new shell, rather than prepped for fire.